It's been awhile since my last empties post. I didn't think that I had accumulated quite enough empties (...rubbish) for the month of February which is why I decided to combine February and March together. Throughout the two months, I've mainly been enjoying my regular staple items rather than working through samples. I was silly and accidentally missed photographing two other samples I had used throughout Feb and March... hence why there are two different photos. - My absolute favourite. 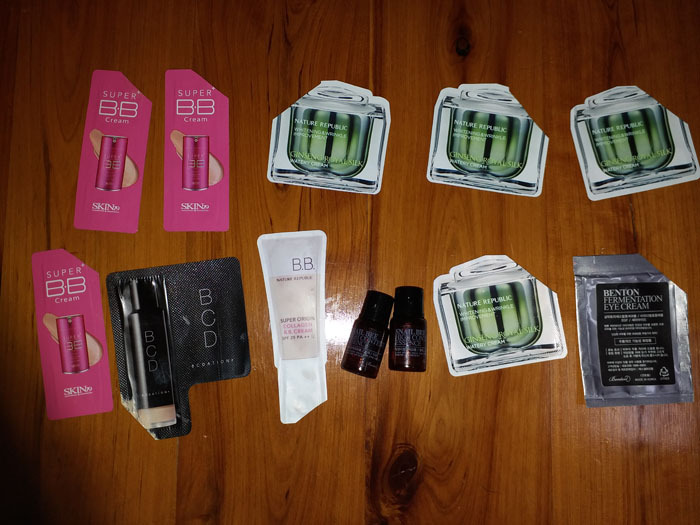 I have noticed that some of the 'newer' BB formulas are lighter and more comfortable so I may switch over some day. But for now, this is my HG BB cream in terms of looking fabulous all day long. WR. - Not gonna lie, I tossed a packet of 10 of these samples into my Testerkorea order because of EXO and the high RRP. The cream itself is a thin, watery gel with bits of gold leaf suspended into it. The Cream smells like pleasant soap. Is it hydrating? Yes. I can't comment on the wrinkle improvement aspect and I admit I haven't properly researched the ingredients. Is it worth the $60-90 USD price tag from using these testers? Nope. WNR. - Not much to say about this one. A bit dry for my skin and the colour didn't really match me, but I think this version was nicer than the first iteration. WNR. 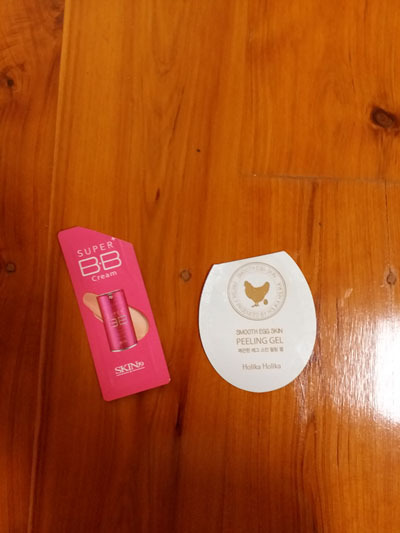 - This is the first BB cream I've ever tried from Nature Republic. I have to say I was impressed! A tiny bit went a long way, and it felt so lightweight and thin on my face, like spreading a moisturiser. I really enjoyed the formula of this and would actually consider purchasing the full-size. Surprise stand out of the month! WR. - I generally like how this feels on my skin and as a layering step. I have to admit that after using the full sized version in 2013 (?) I haven't thought about buying it again. - This was moisturising for my undereye area but once again, the only thing I dislike about this is how it balls up. I don't think I have wrinkles under my eyes yet but I really need to start investing in a good quality eye cream because I've passed 25. - I don't generally purchase peeling gels but I think they are fun to use. This one was no except and my face did feel soft and smooth after rubbing off and rinsing the product from my face. - I've had this for such a long time! 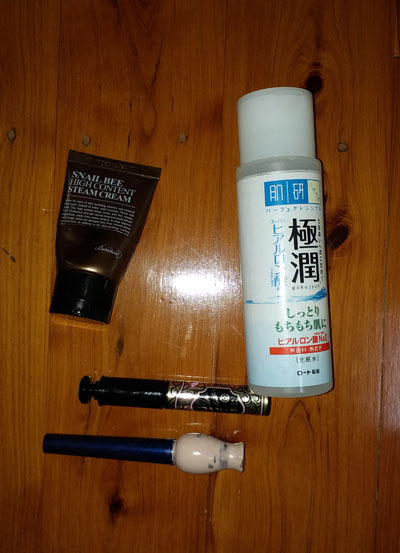 I kept on forgoing my Cream and using oil, and then not using anything when the weather became too hot. This has to be my favourite cream I've used to date, but I'm not sure if I will repurchase it because the price has increased (so stingy). WR. - Another one of my HGs. WR. - This mascara has to have the most unique flat comb in a mascara I have ever seen. It is smudge proof, has fibres, and holds a curl like no other mascara I've ever tried. I love this and have another one in my yet-to-open stash. WR. - This is my second eye primer from Etude House. I liked it because it is nice and thin, and helps to hold my eyeshadow colours. The only downside of this product is the packaging... lots of products gets stuck on the side. You can cut open the bottle with a hobby knife but I cbb for this one because I have an Urban Decay Primer Potion from Lydia to use lol. WR. 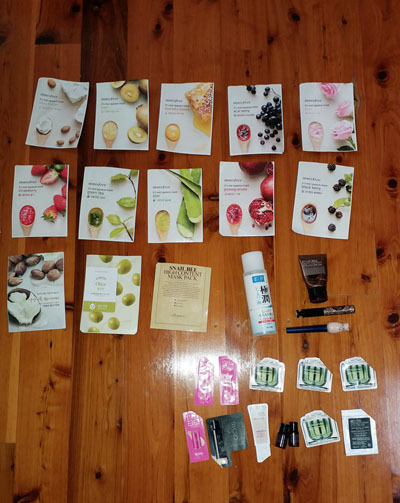 I will work on using up more samples in April, and finally finishing off some full sized products/steps I have been skipping. After I get my delayed clothing and shoe haul, I'll refrain from purchasing anymore Liz Lisa and himekaji/gyaru styled clothing until next year.